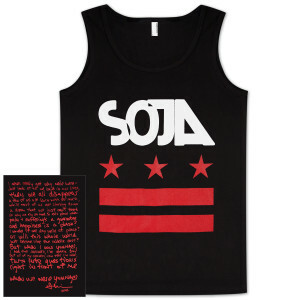 Black American Apparel is 100% cotton and features SOJA's classic Stars & Bars design on the front and lyrics from When We Were Younger on the back. Very comfortable, extraordinaria quality of the printings... I will proudly wear on my back my favourite lines of one of these songs that give sense to life.